Oda starts in a fairly awkward position. It’s an OPM, with only 10 development, and it’s surrounded by a level 3 fort to its north, and a Daimyo that usually has strong alliances to its east. Usually, the first expansion will be westwards because of this. Oda needs good allies for the first years. They become less mandatory as time goes on. Try to ally Daimyos with militarist rulers, such as Uesugi or Yamana, and possibly Hosokawa or other Daimyos with multiple provinces. Usually, Oda will need to send one of them a royal marriage offer, and the other an alliance offer. Then on the next day an alliance with the married Daimyo will be possible. Past that, keep in mind that since expansion is fairly quick, it’s going to be necessary to keep high relations with allies and the emperor. Even though allies take half AE, the AE is going to rack up quick, and it’s normal to have a -200 opinion modifier for AE for the last few Daimyo that will be annexed. Relations with the Shogun need to be kept above 0 at all times. It’s absolutely mandatory. 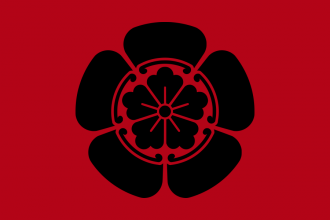 If the Shogun falls below 0 opinion and turns outraged, he can declare on Oda with the casus belli « Annex Daimyo ». If he does that, it’s game over. It’s also important to keep allies happy until they are no longer needed. Keep in mind that there are 2 provinces in Japan with level 3 forts (Mino and Izumo), and even with an excellent siege general, they require 9 regiments to be sieged. 9 regiments will be over force limit for a long time, so it’s important to request help from an ally to take them, or to wait until they are annexed to take the clan having these provinces. If Toki and Amago are annexed, their forts turn into level 2 forts, which are more than manageable. If the player wishes to grant land to an ally in a war and these provinces are available, they should be the priority. It’s especially very convenient if Yamana is an ally, since Yamana will desire Izumo. - Military points are important because they will allow Oda to out-tech neighboring nations. In particular, tech 4, 6 and 7 are all important timings, and reaching them before the rival clans will both deter them and make wars easier. - Diplomatic points are used for 2 purposes : annex vassals if the player decided to conquer Ashikaga before finishing off every other Daimyo, and unlock Exploration + diplo tech 7 quickly. It is also useful to spawn Renaissance. - Admin points are used for coring, and to spawn Renaissance. It’s also important to keep tech up to avoid corruption penalties. Before declaring war, try to position armies so that a quick stackwipe will be possible. Being a Daimyo allows military access all over Japan, which means that it’s possible to chase an army even before a war starts. This will save manpower and time. Hopefully, the player should have conquered all of Japan or become Shogun and have loyal Daimyos by 1490. The next goals will be to colonize Aleut to spawn Colonialism, and to develop Renaissance. The first idea group, if the player wishes to spawn Colonialism, should be Exploration. Colonizing the Kurils or taking out Ainu will open a path to colonize a province near one of the siberian tribes. Conquering them will then allow, with diplo tech 7 and the 3rd idea from Exploration, to colonize Aleut, which increases the player’s channces of spawning Colonialism. As far as later colonizing is concerned, it’s important to remember that the only regions in which will be beneficial are California, Mexico, and Alaska. Because of the way trade nodes are set up, it’s not as profitable to colonize South America or Eastern America, as if the player was in Europe. Spawning Renaissance in Kyoto is fairly self-explanatory : just develop it until it appears. Some provinces are well developed around Kyoto (Settsu…) so it should spread decently fast. Without Mandate of Heaven, Ming will likely be a powerhouse and allied to Korea, making expansion difficult in this area. It is not recommended to expand into Manchuria for the time being either, because it’s usually better to colonize and conquer the islands south of japan which have way more value. This will also prevent Japan’s institutions to ever spread to Ming and Korea, and to trample them later with better tech and ideas. Institutions can’t spread across sea tiles if relations are below 0. That means it’s recommended to keep relations with Korea (and Ming too, if the player chooses to colonize Taiwan) under 0 all the time. This can be done by building spy networks, fabricating claims, setting their provinces as of vital interest, and insulting them. The player should also avoid having a land connection to Ming for now. It’s recommended to develop Printing Press as well, but if the player wishes to play tall, it should be possible to spawn Global Trade and Manufacturies in the Nippon node.